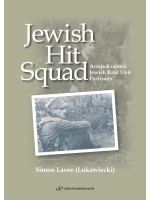 Jewish Hit Squad is about the Armja Krajowa Jewish Raid Unit. This group of partisans operated in the vicinity of Lubaczow - Zamosc June 22, 1941 - July 21, 1944. My parents were partisans who survived the Holocaust hiding in the woods of southern Galicia. But this is not just another story about Jewish partisans during WWII! The crux of the book focuses on a unique situation – a small band of fighters who not only tried to survive German brutality, but actively fought the Nazis during WWII. The book first outlines how my parents were involved with an underground Polish movement – the Armia Krajowa (AK). The irony was that this umbrella group did not particularly like Jews, yet operated a Jewish partisan group led by Mundek Lukawiecki (my father) in the forests of southern Galicia. My father’s Jewish partisan group was actually an AK Hit Squad that took out German soldiers, as well as Polish and Ukrainian Nazi collaborators. Most of their missions were carried out wearing German Wehrmacht uniforms, as members of the group (especially my father) were able to speak German. In addition to these planned “hits”, the group also attacked strategic German targets such as fuel trains, military installations, and general sabotaged Nazi operations. The Hit Squad also undermined the Ost Plan, which was the German/Ukrainian plan to resettle Germans in Zamosc (which became known as Himmlerstadt). The book explains that attempting to stop this plan was in fact the main goal of the AK Partisan movement, led by the local commander, Marian Warda. At the end of WW II, the book examines how Mundek Lukawiecki enlisted in the Polish Communist Secret Police (UB). He essentially crossed the line to the other side and continued to exact revenge on Nazi collaborators. After the UB discovered that he is simultaneously supporting the Israeli underground Etzel in Palestine by sending them Jewish fighters in 1946, he is forced to flee Poland. The book concludes with my parents’ arrival in Israel in 1948. In addition to this unique and remarkable story, we have about 50 pictures of the partisan group/hit squad that were taken during WWII and will be an integral part of the book.